Ambati Raydu(34) and Hardik Pandya(21) guide Mumbai to a six wicket win over Chennai Super Kings. Mumbai's double edged sword, Parthiv and Simmons, were the key ingredients to MI success, as CSK face their 1st home-ground loss in IPL-8. Chennai Super Kings won the toss and Skipper M.S.Dhoni opted to bat first. With a power-packed batting line up that the Super Kings have, the crowd at M.Chidambaram Stadium was certain of the entertainment they would be provided with. To everyone's surprise CSK faltered in the infancy of the game and the super hit Smith-McCullum duo failed to deliver fireworks today. Smith(27) was trapped by Harbhajan Singh and departed early, followed by McCullum(23) who failed to show his magic yet again. Suresh Raina became a victim to young Suchith's game plan, and CSK were 80/3 at one stage, there was pin drop silence in the stadium as the spectators saw their team sink into the sand, disappointment was all around until the got a sight of Captain Cool and they knew that this man could turn the tide for Chennai. M.S.Dhoni once again stood as the pillar of strength for Chennai Super Kings and took the reigns of the chariot is his hand. Aided by young Pawan Negi, Dhoni weaved the CSK innings. 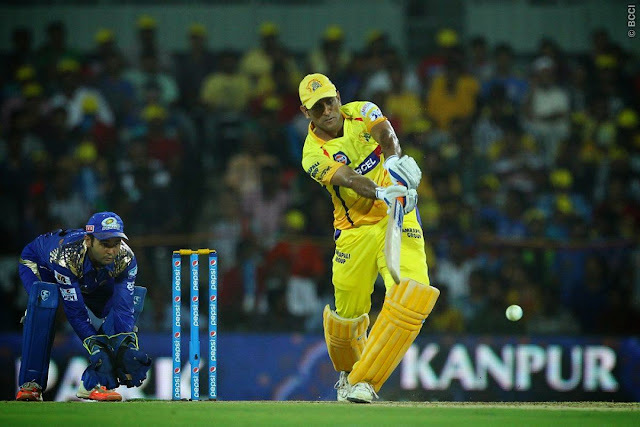 M.S.Dhoni(39*) was the hero who played some swank shots and helped CSK cross the 150 mark. Negi(36) had an equally vital role in CSK's performance on Friday night, but this young gun was sadly run out on the last delivery. Mumbai Indians were successful in mounting pressure on the Super Kings, but their alertness on the field was unimpressive and Mumbai dropped dire catches which could have brought the Super Kings into a Soup of troubles. CSK set up 158 on the board at the end of 20 overs. Mumbai Indians send in their most reliable and fortuitous opening pair, Lendl Simmons and Parthiv Patel to open the 2nd innings of the match. This dyad once again proved their virtue by consolidating a strong platform in the root stage so that the middle order could capitalize on this firm base in the death overs. Patel(45) and Simmons(38) stitched a wonderful opening partnership for MI. Everything was steady and it seemed as if the lads from Mumbai had got the better of the home team when suddenly two quick important wickets got CSK back into the game. Pollard's run out was a big blow for Mumbai as this West Indian is known for his ability to batter the opposition recurrently. A well set Rohit Sharma was caught by Raina near the ropes and it once again created an impression as if Mumbai would once again commit suicide. But to everyone's surprise, Hardik Pandya was the man who rescued Mumbai. His three consecutive sixes eased the pressure and he ended the game on a winning note for his team by smashing a four over the wicket-keeper. 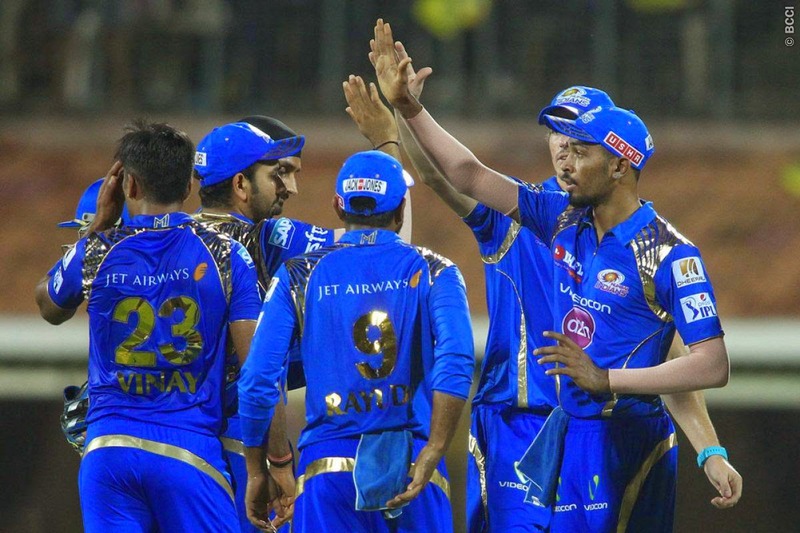 Chennai was defeated in their home ground for the first team in IPL 2015. The Man Of The Match award was bagged by Hardik Pandya for his wonderful knock that was a savior for MI. Mumbai will now take on RCB at Wankhede Stadium on Sunday, while Chennai invite Rajasthan Royals to be their guests on the same day.